What are the chances to suffer from more than one rare disease at the same time? The celebrity cat Lil BUB had it's genome sequenced to be precisely diagnosed with the two rare mutations responsible for her unique phenotype. Rare diseases are a group of disorders that have a low incidence in the population, which often implies reduced interest from public and private entities and, therefore, limited diagnosis and treatment of affected patients. In this study, Bridavsky et al. describe the genome sequence of Lil BUB, a celebrity feline with almost 3 million Facebook followers. Lil BUB has a unique appearance thought to be due to her diagnosed osteopetrosis: a diminutive stature, a distinctive protruding tongue together with a form of polydactyly that makes her have 6 toes on each front paw – all of which contribute to her mass appeal (Fig.1). Whole-Genome Sequencing (WGS) was performed thanks to a crowdfunding initiative to fund the study while engaging the public. 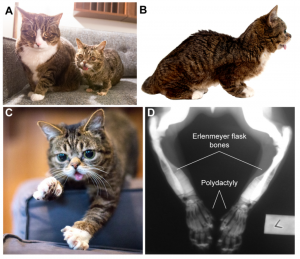 After sequencing, the authors were able to identify two different mutations, showing that Lil BUB presented not one but two different rare diseases: a homozygous allele for the osteopetrosis phenotype and a polydactylyl allele in heterozygosis. In this preprint, the authors discover the genetic basis of Lil BUB’s unique phenotypes and furthermore, demonstrate the power of crowdfunding in not only accomplishing scientific goals, but also for public engagement and science dissemination. Figure 1. Lil BUB complex phenotype showing dwarfism (A), short skull and tongue (B), polydactyly (C) and bone defects in forelimbs (D)(taken from figure 1 of the preprint). Whilst the majority of scientific funding is obtained from competitive grants, Lil’ Bub’s status amongst the internet’s most venerated cats afforded the authors an opportunity to experiment with alternative funding streams for this project. Therefore, the authors embarked on a crowdfunding campaign to cover the costs of sequencing Lil Bub’s genome. Not only was the crowdfunder financially successful (raising over $8000), the opportunity to effectively engage the public with science was also exploited. The authors communicated the aims and progress of the project via various social media platforms, thereby demonstrating that the crowdfunding model can come with societal benefits beyond just the funding of novel research. Osteopetrosis and polydactyly are both rare diseases that have not been linked to one another in humans or cats. Whether Lil-BUB had been affected by an unusual case of osteopetrosis that included polydactyly or by two different rare diseases at the same time was uncertain and this study aimed to answer this and find the genetic causes of her symptoms. Whole-Genome Sequencing (WGS) was performed and revealed a heterozygous mutation in the limb enhancer of the Sonic hedgehog gene, already known to be linked to dominant polydactyly in mammals. Osteopetrosis, however, seemed to be caused by a homozygous recessive allele in the TNFRSF11A gene encoding a truncated version of the transmembrane receptor RANK. The identification of causal mutations in precision medicine constitutes the ultimate goal of NGS-mediated personalized diagnosis. However, due to our restricted knowledge of the genome, determining the clinical significance of mutations in probands is limited to previous reports on similar cases. We chose this preprint because it is an example of how precision medicine can help fine-tuning a phenotype-based diagnosis thus leading to a more accurate description of a patient’s disease and, if possible, an improvement in the treatment. In this case, Lil BUB’s acute phenotype was the result of two different rare diseases. Moreover, this work is a beautiful combination of how the creativity and enthusiasm of a committed group of scientists took over possible money burdens and launched an initiative that allowed them not only to fulfill their research purposes, but to reach an audience of tens of thousands of people, who they kept engaged and updated with their scientific advances. – Lil Bub’s celebrity status was clearly important for a successful crowdfunding campaign. Do you think it would be possible to fund a project like this without the existing fanbase that Lil Bub brought with her? – Are you considering crowdfunding as a periodic way of funding some of your research projects? Would there be a potential danger for projects to become too biased on mediatic research? – After the success of this research, how do the authors envision the future of crowdfunding in science? Could there be too many projects trying to use this strategy and, thus, many of them fail to succeed? – What would be the advice for young motivated researchers who want to get both funding and public engagement? – Many different mutations affecting the ZRS limb enhancer cause ectopic anterior expression of the Shh gene and UK1, UK2 and Hemingway mutations are examples of that . Is it known which transcription factor/s bind the ZRS enhancer? Do the authors think the different mutations affect the same putative binding site? – ZMPSTE24 is a metalloprotease involved, among other things, in Lamin A maturation and knockout mice have been studied due to the similarities with phenotypes of patients with Progeria syndrome, showing strong phenotypes in mice when in homozygosis . In Hutchinson-Gilford Progeria Syndrome (HGPS), a heterozygous point mutation affecting a splicing site in LMNA gene that impairs correct Lamin A maturation and causes premature aging. However, while in humans this mutation appears spontaneously and causes severe phenotypes in heterozygosis, the equivalent mutation in mice confers the strong phenotype when the animals are homozygous . Due to the differences in the phenotype effect of heterozygous and homozygous mutations in human and mouse, we were wondering whether the heterozygous loss-of-function allele of ZMPSTE24 has been reported in cats and if the allele found in Lil BUB’s genome could be contributing to her congenital malformations. Lettice LA, Hill AE, Devenney PS and Hill RE. 2008. Point mutations in a distant sonic hedgehog cis-regulator generate a variable regulatory output responsible for preaxial polydactyly. Hum Mol Genet. 17, 978-985. De la Rosa J, Freije JMP, Cabanillas R, Osorio FG, Fraga MF, Fernandez-Garcia MS, Rad R, Fanjul F, Ugalde AP, Liang Q, Prosser HM, Bradley A, Cadiñanos J, Lopez-Otin C. 2013. Prelamin A causes progeria through cell-extrinsic mechanisms and prevents cancer invasion. Nat Comm. 4:2268. Osorio FG, Navarro CL, Cadiñanos J, Lopez-Mejia IC, Quirós PM, Bartoli C, Rivera J, Tazi J, Guzman G, Varela I, Depetris D, de Carlos F, Cobo J, Andres V, De Sandre-Giovannoli A, Freije JMP, Levy N, Lopez-Otin C. 2011. Splicing-Directed Therapy in a New Mouse Model ofHuman Accelerated Aging. Sci Transl Med. 3, Issue 106, pp. 106ra107. Lil Bub’s celebrity status was clearly important for a successful crowdfunding campaign. Do you think it would be possible to fund a project like this without the existing fanbase that Lil Bub brought with her? Lil Bub’s fanbase was undeniably crucial to the success of our funding campaign. This is clearly depicted on Figure 2 of our manuscript, where page views and donations spiked when our crowdfunding campaign was mentioned on Lil BUB’s social media pages. We always knew that her popularity was going to help us raise the funds needed for the project, but getting a broad audience interested in the outcome of your project is inherent to the concept of a crowdfunding campaign. Each crowdfunding campaign must have an idea of who is going to donate, and LilBUB was our door-opener. For this reason it is difficult for us to imagine how our funding campaign would have played out without the ‘celebrity’ aspect, but there have been other crowdfunded science projects that successfully raised more money than we did without having such a well-known internet phenomenon at the heart of their research. Some of our favorites include the Kakapo project, which aims to sequence the genomes of all 125 remaining endangered kakapo birds in New Zealand (which raised $45,400)  and the Bighorn Basin Dinosaur Project that raised money for its field expeditions between 2015-2018 . This demonstrates a commitment from the public to know more about and to participate in scientific endeavors, and shows that it is in our hand, as scientists, to engage this audience in our research and to provide appropriate tools for a better understanding of the scientific method. When scientists can get the public interested in the science and spend enough time on outreach it is possible to raise large amounts of money. However, we also believe that crowd-funded research requires extensive time-engagement on behalf of scientists, and that can be difficult to reconcile with such a demanding career. Are you considering crowdfunding as a periodic way of funding some of your research projects? Would there be a potential danger for projects to become too biased on mediatic research? Through our experience with the Lilbubome, we learned that crowdfunding has a lot of potential for funding of small-scale projects with targeted questions. We believe that this combination of factors creates a very specific niche that nicely complements traditional funding, which is normally focused on larger-budget research. So if a funding agency doesn’t support a really cool experiment, crowdfunding might be a way to get the money. But we’re also aware of the hard work it takes to raise funds this way, so we would likely only consider this option under special circumstances in the future. Since crowdfunding is generally targeted towards a broad audience, it is of course easier to raise money for projects that broadly appeal the public. We don’t think there’s an inherent problem with media-friendly research. In fact, we feel that it’s rather the opposite: crowdfunding research is a unique opportunity to bring science out of the lab, and it also enables us to tackle questions very scientifically that non-scientists might ask during their normal lives . After the success of this research, how do the authors envision the future of crowdfunding in science? Could there be too many projects trying to use this strategy and, thus, many of them fail to succeed? Before we consider the financial aspect of crowdfunding, we want to emphasize that a crowdfunding campaign provides a great framework to reach out to an audience and discuss science with them. It is a campaign, which means that it focuses your attention on outreach over a restricted period and gives you a goal to achieve – instead of leaving a lot of loose ends. If one would want to reach out to an existing community (e.g. outsource “data analysis” in a gamefication project) a crowdfunding campaign might be just the right thing to focus these efforts. From the financial perspective, we anticipate that crowdfunding will continue to fill a small but important niche in science funding. The amounts raised are typically low (median $3,015, average $12,652 on experiment.com ) compared to traditional routes of funding, but it can be a way to empower people (e.g. PhD students, citizen scientists) who otherwise might not have access to funding or it could be used to fund purely curiosity-driven research that might not be supported by government funding. However, given the large time commitment needed for a successful campaign and the small sums that are involved, we predict that most scientists will not use crowdfunding as a routine way to obtain financial support for their research. 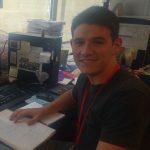 What would be the advice for young motivated researchers who want to get both funding and public engagement? Second, think carefully about your target audience and the message you want to convey: it is easy to get lost in the details of your ideas, so having a central theme to which you can return and using language that fits your audience is key to the success of both engagement and funding. Many different mutations affecting the ZRS limb enhancer cause ectopic anterior expression of the Shh gene and UK1, UK2 and Hemingway mutations are examples of that . Is it known which transcription factor/s bind the ZRS enhancer? Do the authors think the different mutations affect the same putative binding site/s? The most convincing data about the transcription factors that function of the ZRS in the limb are from detailed in another paper by Lettice et al, who specifically highlight the opposing roles of different ETS factor family members . Some polydactyly-causing ZRS mutations directly affect the binding sites of these factors, but it is unclear whether all different mutations would act via the same mechanism. Interestingly, both the Hemingway mutation and the UK2 mutation are immediately adjacent to one of the sites identified by Lettice et al as an ETS binding site (ETS site 2 in their paper), so we can speculate (but have no evidence) that these mutations somehow change binding at the adjacent site. ZMPSTE24 is a metalloprotease involved, among other things, in Lamin A maturation and knockout mice have been studied due to the similarities with phenotypes of patients with Progeria syndrome, showing strong phenotypes in mice when in homozygosis . In Hutchinson-Gilford Progeria Syndrome (HGPS), a heterozygous point mutation affecting a splicing site in LMNA gene that impairs correct Lamin A maturation and causes premature aging. However, while in humans this mutation appears spontaneously and causes severe phenotypes in heterozygosis, the equivalent mutation in mice confers the strong phenotype when the animals are homozygous . Due to the differences in the phenotype effect of heterozygous and homozygous mutations in human and mouse, we were wondering whether the heterozygous loss-of-function allele of ZMPSTE24 has been reported in cats and if the allele found in Lil BUB’s genome could be contributing to her congenital malformations. To date, we are not aware of any known mutations in ZMPSTE24 in cats. However, we considered RANK a much more likely causal candidate for Bub´s osteopetrosis, given the close resemblance between the human and mouse RANK mutation phenotypes, and that ZMPSTE24-deficient mice develop loss of bone mass, rather than increased calcification [8,9]. We cannot exclude, though, that the heterozygous ZMPSTE24 mutation could potentially modify some of Lil BUB’s traits, including the osteopetrosis. 4. Crowdfunding campaign: Iorns D, Dighy A, Robertson Bruce and Howard JT. Sequencing the genome of all known kakapo. 5. Crowdfunding campaign: Schein JP. Help us excavate a dinosaur bonebed in Wyoming’s bighorn basin. 6. Sauermann H, Franzoni C, Shafi K. 2019. Crowdfundingcientific research: Descriptive insights and correlates of funding success. PLoS ONE 14(1): e0208384. 7. Lettice L et al. 2012. Opossing functions of the ETS factor family define shh spatial expression in limb buds and underlie polydactyly. Dev Cell. 22, 459-467. 8. Rivas D et al. 2009. Accelerated features of age-related bone loss in Zmpste24 metalloproteinase deficient mice. The Journal of Gerontology. 64A, 1015-1024. 9. Bergo MO et al. 2002. Zmpste24 deficiency in mice causes spontaneous bone fractures, muscle weakness and prelamin A processing defect. PNAS. 99(20), 13049-13054.